On October 31, the World Bank published its Doing Business 2019 report, an annual report that measures business regulations across 190 countries. This year’s report declared Afghanistan one of the top 10 improvers in doing business alongside China, India, Azerbaijan, and Djibouti. Afghanistan climbed 16 positions in the rankings from last year, advancing from 183rd in 2018 to 167th in the 2019 report. It showed remarkable improvement in at least four of the 10 indicators measured: Starting a Business (47th), Protecting Minority Investors (26th), Resolving Insolvency (74th), and Getting Credit (99th). The report was launched three months after the Special Inspector General for Afghanistan Reconstruction tweeted, “Afghanistan ranked 183rd out of 190 economies in #WorldBank‘s Doing Business 2018 report; same ranking as 2017.” The tweet reflected harsh criticisms from the media and the private sector of the Afghan government’s failure to facilitate the development of Afghanistan’s private sector business environment. In a press conference held on October 31, Ajmal Ahmady, Afghan President Ashraf Ghani’s senior economic advisor, stated that Afghanistan’s impressive rise in the Doing Business rankings manifests the Afghan government’s firm commitments to improve the legal and regulatory business environment, as well as bolster institutions to increase private sector engagement in the country. The World Bank credits Afghanistan’s unprecedented advancement in the rankings to a record number of business reforms in the past year that made it easier to start a business, access credit, pay taxes, resolve insolvency, and protect minority investors. Earlier this year, the High Economic Council, led by Ghani, decided to reduce the cost of a business license from 82.3 percent of the income per capita to only 6.4 percent, and a “One Stop Shop” was established to bring all business licensing sources under a single roof. These were crucial steps in making business licensing efficient and cost effective for the private sector, resulting in an impressive boost in Afghanistan’s ranking for the Starting a Business indicator — jumping from 107th in 2018 to 47th in 2019. The Afghan government, furthermore, enacted a new Limited Liability Companies (LLC) Law that substantially mitigates the risks of prejudicial conflicts of interest in companies and strengthens corporate governance structures. The LLC law has strengthened minority shareholder protections against misuse of corporate assets by directors for their personal gain and enhanced shareholder rights, governance safeguards and corporate transparency requirements to minimize the risk of abuse. Thus, Afghanistan, with a score of 71.9 in Protecting Minority Investors index, is only behind India in the South and Central Asia region. Afghanistan jumped high in the rankings for Resolving Insolvency (from 161st in 2018 to 74th in 2019) and Getting Credit (from 105th in 2018 to 99th in 2019) indicators, thanks to the newly adopted insolvency framework that puts in place a robust regime allowing reorganizations and liquidation, improving the continuation of the debtor’s business during insolvency proceedings, increasing creditor’s participation in the proceedings, and easing access to credit by improving the legal and institutional foundations for getting credit, according to the World Bank. Afghanistan’s Doing Business reforms are implemented amid an uncertain economic situation. GDP growth has drastically fallen from 14.5 percent in 2012 to 2.6 percent in 2017. Stagnating economic growth, increasing demographic pressures and a deteriorating security situation have exacerbated poverty, up to 55 percent in 2016-17 from 38 percent in 2011-12. The unemployment rate has reached 40 percent. A poor business climate, on the other hand, has encouraged higher regulatory barriers and costs to businesses, hampering private investments. Therefore, reforms in investment climate were imperative for Afghanistan to attract foreign investments, promote domestic entrepreneurship and formalize the economy, thereby increasing innovation, growing productivity, and catalyzing profitability for firms. “Improving the business environment is essential for Afghanistan to stimulate domestic investment and create jobs. Given the exceptional challenges of conflict and violence in the country, the government’s resolve to improve the business climate for private enterprise is doubly commendable,” said Shubham Chaudhri, World Bank Country Director for Afghanistan. 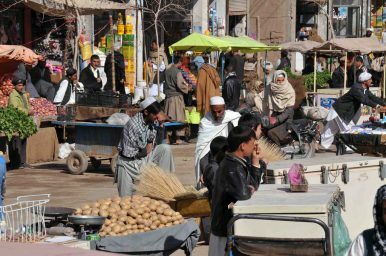 Despite reforms initiated by the government, Afghanistan still faces critical barriers to doing business. The country lags in several other Doing Business indicators, including Getting Electricity (168th), Dealing with Construction Permits (184th), Registering Property (186th), Paying Taxes (177th), Trading Across Border (177th), and Enforcing Contracts (181st). Ahmad W. Majidyar is a private sector development expert and the former Vice-President of the Afghanistan Investment Support Agency.